Could Audi A4 compete with the BMW 335i? 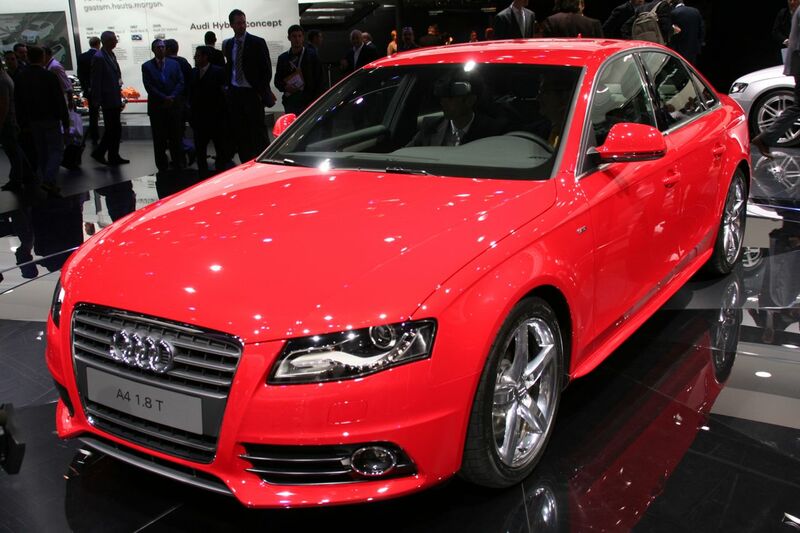 Home / Auto Shows / Could Audi A4 compete with the BMW 335i? Well, it might, especially after Audi has unveiled their latest A4 design. The new A4 takes plenty of lines from the A5. It's still sporty, it simply has a few more creases for you to catch your eye on. On top of the new obvious body style improvements, there are new engines that provide better power and get better gas mileage. The 1.8-liter petrol gets 160 bhp while the the 2.0-liter diesel makes do with 143 bhp, but comes good with 260 ft-lb. The largest engine available that will be in a direct competition with the BMW 335i, it's the 3.2 FSI with 265 bhp that runs from 0-60 in 6.2 seconds. Audi is also joining BMW and Mercedes in the anti-pollution movement and their new engines are the right step in that direction. I'm wondering if any die-hard BMW fans will jump the fence. Here is the full press release if you're interested. It's a little long but there is some good information in there. In its design, the new A4 reveals its sporty, progressive character: taut and dynamic in its outlines, it speaks the language of technical perfection. With an overall length of 4.70 metres, the saloon has a substantial, powerful road stance and offers its occupants ample space in an interior full of light. The workmanship is typical of an Audi – quality with no compromises. The controls can be backed by the extra refinement of innovative assistance and multimedia systems. In the safety area, the brand with the four-ring emblem sets new standards: the coordinated action of the airbags and front seat belt force limiters protects the occupants even more effectively. When compared with the previous model, the A4 has new, sporty proportions. The front body overhang has been drastically shortened; the bonnet and wheelbase are both longer than before. In the driveline, the differential has changed places with the clutch (or torque converter), making it possible to move the front axle forward by 154 millimetres. This innovative solution ensures ideal axle-load distribution. 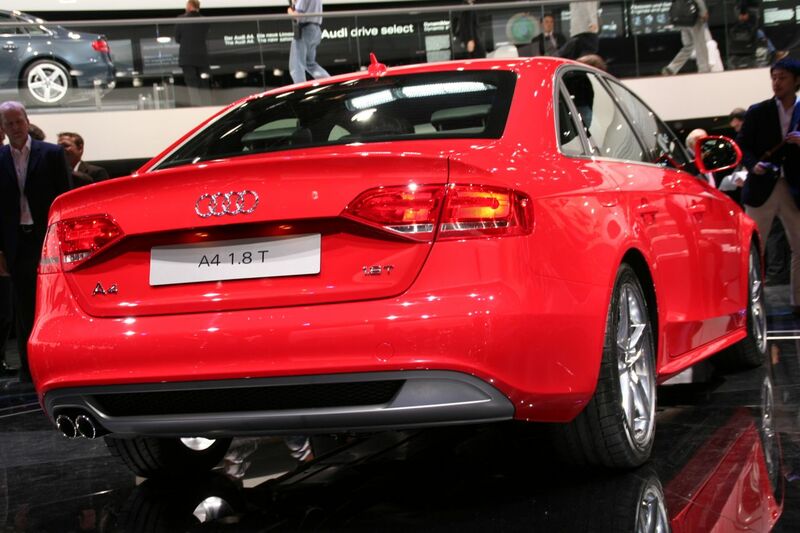 The new A4 is the sportiest saloon in the midsize car category: agile, light and precise to control. Its dynamic suspension is a totally new design, with most of its components made from weight-saving aluminium. The results are impressive: supremely dynamic road behaviour and effortlessly precise handling. New high-tech options make the A4 driving experience even more fascinating: Audi drive select varies the engine, automatic transmission, steering and suspension damping characteristics to suit the driver's preferences at any given moment. Audi dynamic steering varies its ratio according to the car's speed and keeps the new A4 stable close to the handling limits by slight, almost instantaneous changes to the steering angle. The damping control system for the hydraulic shock absorbers varies the damping characteristic individually, to combine sporty driving enjoyment with maximum road safety. The new Audi A4 is being introduced with a choice of five engines, their power outputs ranging from 105 kW (143 bhp) to 195 kW (265 bhp). The four-cylinder petrol engine, like the diesels, is turbocharged, and both types of engine have direct fuel injection. All the engines, with their supremely refined flow of power, make the A4 a pleasure to drive and, thanks to their high efficiency, consume distinctly less fuel than the previous versions. Various transmissions are available: a six-speed manual gearbox, the tiptronic automatic transmission, the multitronic continuously variable transmission, and either front-wheel drive or quattro permanent all-wheel drive, which has been subjected to intensive development work that has made its performance even more dynamic. The new Audi A4 has many fascinating sides to its character, all of them expressed by the outlines of its body. Their high-tech precision clearly demonstrates the leading position that Audi occupies in automobile design. The new A4 has a spacious saloon body and a firm, muscular stance on the road. Its length (4703 millimetres) and width (1826 millimetres) exceed those of its core competitors, and sporty dynamics were the guiding principle in its development. The proportions have a new balance compared with the previous model: the front body overhang has been considerably reduced and the bonnet and wheelbase are now noticeably longer. A long, coupe-style roof line emphasises the flowing silhouette. The roof meets the side sections of the body at an almost invisible zero-gap joint – just one of the many details that uphold the Audi principle of high technical precision. The completely new outer body panels of the A4 consist of sculptured, curving surfaces framed by sharply defined outlines. The 'dynamic line' above the door sills rises slightly to the rear, the 'tornado line' below the windows slopes down. In this way the two contours add profile and dynamic balance to the sides of the car. Large wheels and boldly styled wheel arches emphasise this impression of concentrated energy. The new A4 is a car that presents a confident personality to the outside world – an impression borne out by the broad, low, sporty 'single-frame' radiator grille. The optional-extra xenon headlights are technical works of art, with powerful visual accents set by their electrodeposited chrome 'wings' and the standard daytime driving lights. Depending on the lighting technology used, their design differs: in the xenon plus headlights, the daytime driving lights each consist of 14 white light-emitting diodes. The rear end of the body, which tapers strongly inwards, interprets the car's sportiness in a most convincing way. The slim, tapered-off light units create a visual relationship with the road. The exhaust tailpipes are straight – even on diesel-engined cars a hint at the powerful character of the TDI engines. A4 models with the sporty S line exterior package differ in certain details, for instance the front air dam. The new Audi A4 can be supplied in 15 body colours – a wider choice than that offered by any of its competitors. There is ample space for the occupants and their luggage in the light, generously sized interior of the new Audi A4, with its clear layout and attractive styling. Thanks to new high-tech materials and processes, the bodyshell is even safer and more rigid than the previous model, although it weighs significantly less. With a drag coefficient of cD = 0.27, the new Audi A4 has the wind-cheating outlines that make for quiet, efficient travel. Inside the new A4 there is a sense of light and space that would do justice to a car in a much larger category. The saloon's 2808-millimetre wheelbase is not only more generous than its core competitors but also distinctly longer than the previous model. The interior is now 20 mm longer and rear-passenger knee room has gone up by a remarkable 36 mm to 908 mm. Headroom and width at shoulder height have also been increased. Every passenger in the new A4 has access to convenient features such as large cup holders and softly upholstered armrests. To sit in the new A4 is to feel comfortable and content from the very first moment on – a typical 'Audi effect'. The interior seems to fit the occupants like a wellmade sports jacket. Its graphic design, featuring taut surfaces and dynamic lines, conveys precisely the sense of lightness and athletic vitality that is inherent in every aspect of the new Audi A4. The choice of materials, how they are used and how satisfying they feel are factors that delight the senses of those who ride in this new car. Every element reveals the careful attention to detail and the already proverbial striving for top quality that are associated with Audi as a premium brand. The switches, for instance, operate with precisely defined effort and no excess movement; the rotary controls click smoothly into place at each setting. This is the sound of true technical perfection. An optional-extra lighting package adds still more lustre to the interior. The front seats are designed to integrate the driver and passenger perfectly into the sporty ambience. Their height can be varied, and they support and locate the occupant's body ideally. The driver's hand instinctively finds the gear lever where it is expected; the position and angle of the steering wheel and pedals seem to have been chosen to suit the driver's very own preferences. The steering wheel can be adjusted by 60 mm in reach and 50 mm in height. As an alternative to manual seat adjustment, Audi can supply electric seat adjustment as an extra, with a position memory function as an additional option. Another optional extra is seat cushion and seat back heating. If the sports seats are chosen, the seat base angle is adjustable, the seat cushion can be extended and electric four-way lumbar support is a standard feature. The new 'Climatic Comfort' seats bring a touch of true large-car luxury to the Audi A4. They are upholstered in perforated leather and have small fans with six speed settings to ventilate the seat cushion and seat back. To avoid the risk of excessive cooling, a heating function cuts in automatically. The 'Comfort' seats are available in a specially perforated version of the Milano leather upholstery, in a choice of four colours. For the standard and sports seats a second type of leather (Valcona) is available, and the sports seats can be obtained with combined Alcantara and leather upholstery. In every area of its colours and materials, the new Audi A4 pursues a sporty, elegant approach. In addition to the standard decor inlays, an aluminium version and three types of wood that can also be combined with a special aluminium look are available. The sporty S line has a black interior including the roof lining. The boot now holds 480 litres whether the car has front-wheel drive or quattro permanent all-wheel drive. This volume is larger than any direct competitor can offer. The loading height is only 673 millimetres, and together with the flat floor and straight side panels makes the boot extremely practical in use. For larger loads, for instance after major shopping trips, the rear seat back can be folded down in two sections, thus increasing the load volume to a maximum of 962 litres. A load-through facility with detachable ski sack can be ordered as an optional extra. On every new A4, the boot lid can be released in three convenient ways: by radio signal from the remote control, with a pushbutton on the driver's door or with the electric soft-touch release in the boot lid handle recess. The lid then swings up automatically on its new hoop-pattern hinges; only slight effort is needed to close it. The technical features of the steel bodyshell are also evidence of the major steps forward that have been taken on the new Audi A4. The body is extremely light in weight: although almost twelve centimetres longer and over five centimetres wider than its predecessor, the bare bodyshell weighs about ten percent less – an excellent starting point for a saloon car of low gross weight. 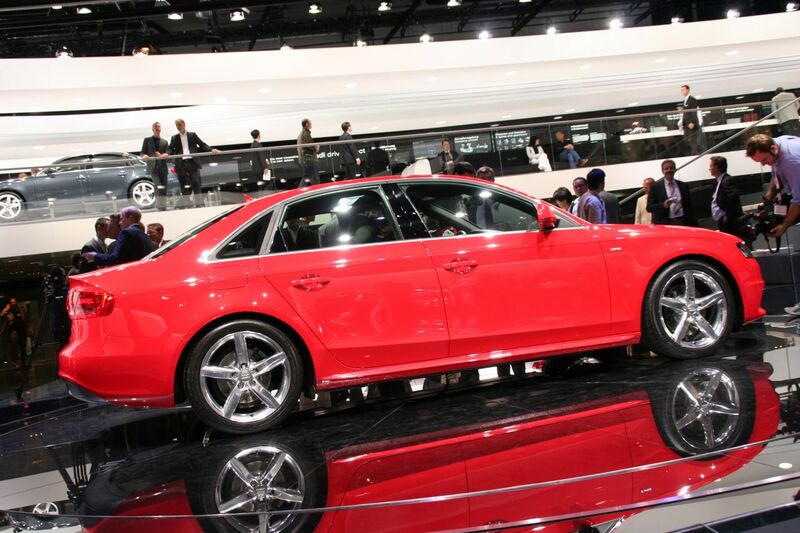 The Audi A4 1.8 TFSI, for instance, tips the scales at only 1,410 kilograms. This weight saving is due to specific use of new grades of steel that combine exceptional strength with low weight. Only these ultra-high-strength steel grades give the body the high level of rigidity needed for precise, sporty handling and excellent ride comfort. Audi is the first automobile manufacturer to produce these 'tailored blanks', as they are called, from ultra-high-strength steel in its own factory. They account for 12 percent of the weight of the new A4's bare bodyshell without doors, lids and windows. 18 percent are accounted for by ultra-high-strength steel grades, 32 percent by high-strength steels and 38 percent by conventional deep-drawing grades of steel. Audi makes use of a number of sources including the large database that it has compiled itself: the Audi Accident Research Unit (AARU) investigates and analyses accidents all over the world. One of its findings is for instance that persons of smaller stature are still exposed to greater risk of injury in a frontal crash than others. For this reason, Audi has coordinated the network of occupant restraint systems more closely than has ever been the case in a midsize car. Sensors on the seat rails determine the actual position of the seats. This data is supplied to the control unit that regulates the action of the adaptive seat belt force limiters and airbags. In this way the distance available for the belt and airbag to restrain the upper part of the seat occupant's body can be used as effectively as possible. Six airbags are installed in the new Audi A4 as standard, with two more as an optional extra for the outer rear seats if required. Isofix child seat mountings at the rear are another optional extra, and are also available for the front passenger seat, in which case its airbag is de-activated. The front seats and head restraints are designed to support their occupants safely if the car is involved in a rear-end collision. The new A4 is one of the first cars to comply with all the new legal requirements in Japan and Europe regarding a collision with a pedestrian. It is also well equipped to withstand minor impacts with solid objects or other vehicles at speeds up to 15 km/h without damage to the main body structure. The new Audi A4 cleaves the air ahead of it smoothly and quietly, like a large luxury car, thanks to careful attention to detail design in the aero-acoustic wind tunnel. The drag coefficient (cD) of the basic version is only 0.27. Depending on which engine is chosen, the overall aerodynamic drag is between three and five percent lower than the equivalent preceding models, although the frontal area of the new, wider body has gone up from 2.14 to 2.19 square metres. Good airflow around the body is aided by an almost complete undertray. Optimal car control is one of the major areas of competence in which Audi leads the way. The new A4 is convincing in its ergonomics, which are logical in every detail and permit the controls to be operated intuitively. The cockpit in the new Audi A4 is clearly oriented toward the driver. The centre console is inclined at 8 degrees to the driver's side of the car and forms a single visual unit with the instrument panel. A multifunctional leather-covered sports steering wheel with three spokes is available as an optional extra. It has small drum-type and pushbutton controls for the basic functions of the navigation and audio systems, the car phone and the voice control system. For the A4 with automatic transmission, shift paddles behind the steering wheel rim are another optional extra. In many aspects of its detail design, Audi's new midsize saloon pursues the same approach taken on the A8, its larger sister-model in the luxury segment. The Driver Information System (DIS) display located between the speedometer and revolution counter dials is a standard item on cars with a V6 engine. A 6.5-inch black-and-white display screen is located on the upper part of the centre console, where it can also be clearly seen. It supplies information on the audio and air conditioning systems and the settings possible when the CAR menu is selected. These settings enable customers to configure many of the car's functions themselves. The large switches and pushbuttons on the standard audio systems with MMI control logic are ideally positioned for easy operation, between the automatic air conditioning and the ventilation outlets. When the new Audi A4 is ordered with a navigation system, the Multi Media Interface (MMI) is integrated into the centre tunnel. MMI has been highly praised by testers on many occasions and has proved to be superior to systems offered by competitors. 15 large switches and a volume control are grouped around a central turn-and-press knob, and used to select the navigation, information, CAR menu, set-up, telephone, address book, CD/TV and radio functions effortlessly, intuitively and logically. If the car has the high-end navigation system with DVD drive, all the relevant information appears on a colour screen measuring 7 inches from corner to corner. Driving off safely and smoothly: the electro-mechanical parking brake Another control on the centre tunnel operates the electro-mechanical parking brake, a convenient luxury feature also derived from the Audi A8. It assists the driver when the car is moving away from a standstill, and also functions as an emergency brake. The optional-extra Audi hold assist adds extra functions. The space formerly occupied by the handbrake lever can be used for additional convenience: as an optional extra, a centre armrest with extra-soft upholstery can be installed, with two 12-Volt power sockets beneath it. The new radio-operated key for the Audi A4 has no conventional blade: to start the engine, the key is simply pressed into the ignition switch. It can memorise several of the car's specific settings and also store servicing information and fault messages. The 'advanced key' high-end version means that the key does not even have to be taken out of the driver's pocket. In this case sensors are used to lock and unlock the car and the engine is started and stopped by means of an elegantly designed pushbutton on the centre tunnel. Audi supplies various stages in headlight technology. In the top version, the xenon plus headlights can be combined with 'adaptive light', which directs the headlight beams in the appropriate direction as the car turns a corner. The new A4 is supplied with automatic air conditioning as standard equipment; the system is an entirely new, more efficient development that has enabled cooling performance to be increased by 10 percent and at the same time the fuel consumed to operate the air conditioning has been reduced by 20 percent. As an optional extra, a version with three temperature zones can be ordered; it permits separate control of temperature and airflow for the driver, front passenger and rear passengers. The new A4 is being launched with a choice of five powerful, refined engines. All of them, both petrol and diesel, use direct fuel injection, and the two four-cylinder units and the V6 TDI engines are turbocharged. With their splendid flow of power, these engines make driving the new A4 nothing less than pure pleasure. They also use less fuel than the equivalent engines in the previous model. Customers furthermore have a wide choice of high-tech transmissions: either a manual gearbox or automatic transmission can be specified. They transmit power to the front wheels or to a quattro permanent all-wheel driveline that has particularly dynamic settings. Like the TDI diesels, the two petrol engines, the 3.2 FSI and the 1.8 TFSI, use the direct injection principle, in which fuel is delivered directly to the engine's combustion chambers. When this fuel vaporises, it absorbs heat from the combustion chamber walls, which allows the engine to operate at a higher compression ratio. Its overall efficiency is thus higher – power and efficiency go together in every Audi. The new 3.2 FSI, a member of Audi's ultra-modern family of V engines, is the most powerful unit available in the new A4. From a displacement of 3197 cc, it develops 195 kW (265 bhp) and also delivers 330 Nm of torque all the way from 3000 to 5000 rpm. It accelerates the A4 3.2 FSI quattro with manual gearbox from a standstill to 100 km/h in only 6.2 seconds, and maintains this flow of power until the governed top speed of 250 km/h is reached. As an alternative from 2008 onwards, this engine can be combined with the 6-speed tiptronic automatic transmission; in either case, it delivers its power to the road via quattro permanent all-wheel drive. The engine's inlet valves are actuated by a pioneering innovation: the Audi valvelift system (AVS). It uses sliding sleeves (cam elements). These have different profiles, one alongside the other. They are slid along the camshafts in order to obtain smaller and larger amounts of valve lift. The purpose of AVS is to ensure that the combustion chambers are always ideally filled; the throttle butterfly can then remain fully open in most cases, so that the engine breathes more efficiently. The Audi A4 3.2 FSI with manual gearbox is content to consume an average of only 9.2 litres per 100 kilometres, 1.2 litres fewer than the previous car with a 188 kW (255 bhp) engine. About half of this improvement is due to the new valve actuating principle; the other half has been achieved by minimising internal friction. Oil pump volume is now smaller, with an optimised loss rating. Like the water pump, it now delivers a demand-controlled flow – another means of reducing fuel consumption. The smaller of the two petrol engines, the compact four-cylinder 1.8 TFSI, is a highly efficient unit that develops 118 kW (160 bhp) and a torque of 250 Nm between 1500 and 4500 rpm from a displacement of 1798 cc. It accelerates the manual-gearbox A4 in 8.6 seconds to the typical main-road speed of 100 km/h, and maintains its thrust up to a top speed of 225 km/h. Yet according to the EU test cycle its consumption is only 7.1 l/100 km –1.1 litres per 100 kilometres better than the previous model. As an alternative to the manual gearbox, multitronic continuously variable transmission can be ordered, in both cases with front-wheel drive. The 1.8 TFSI is a close relative of the 2.0 TFSI engine chosen three times in succession by a jury of international journalists as "Engine of the Year". On this smaller version for use in the latest model line, direct petrol injection and turbocharging represent an ideal combination. Injection pressure has been increased to 150 bar, and new injectors distribute the fuel accurately to the combustion chambers. The turbocharger is exceptionally rapid in its response – at an engine speed of 2000 rpm it accelerates the engine 30 percent faster to a ten percent higher torque than the conventional 1.8T engine that powered the preceding model. For all its vigour, this four-cylinder unit runs quietly, in a most refined manner. The three diesels for the new Audi A4 are two V6 units and a four-cylinder inline engine. Their strong performance makes them ideal representatives of a modern, powerful form of sporting character. Winning the Le Mans 24-hour race in 2006 and 2007 with the Audi R10 competition car was ample evidence of the power that can be summoned up by the TDI principle. Audi first introduced this efficient technology back in 1989, and it has remained the most efficient in the world to this very day. Since then, the brand with the four-ring emblem has not ceased to develop its technological lead. The three-litre diesel is a new member of Audi's V-engine family. It develops 176 kW (240 bhp) and has a peak torque of no less than 500 Nm all the way from 1500 to 3000 rpm. This large TDI unit, with its displacement of 2967 cc, makes the new A4 even more of a sports saloon. It needs only 6.1 seconds to accelerate to 100 km/h from a standing start, and has a top speed of 250 km/h, yet its average fuel consumption is a more than modest 6.9 l/100 km. The 3.0 TDI always has quattro permanent all-wheel drive. The V6 TDI's engine block is made from a light but rigid high-tech material: vermiculite graphite cast iron. Inside the engine, intensive fine tuning measures have minimised friction losses. The latest generation of common-rail fuel injection is used. Its high operating pressure atomises the fuel extremely finely, for a more uniform mixture and efficient combustion. The piezo injectors operate with immense speed and permit the fuel injection stroke to be divided up into individual stages, so that the engine runs exceptionally smoothly. The exhaust-driven turbocharger is also a unit from the latest design generation. A high-speed actuating motor alters the position of its guide vanes, so that high torque builds up more rapidly and spontaneously. The 3.0 TDI already complies with forthcoming Euro 5 limits. A novel exhaust gas recirculation concept with increased cooling performance is used to reduce emissions of oxides of nitrogen. The 2.7 TDI engine, with a displacement of 2698 cc, has been derived from the 3.0 TDI, and also complies already with the future Euro 5 exhaust emission limits. Its output is 140 kW (190 bhp) and it develops up to 400 Nm of torque between 1400 and 3250 rpm. As a result the A4 2.7 TDI sprints to 100 km/h from a standstill in 7.7 seconds and can reach a top speed of 226 km/h. Its average fuel consumption, on the other hand, is a modest 6.6 litres per 100 kilometres. The standard specification of this model includes multitronic continuously variable transmission and front-wheel drive – an ideal combination for relaxed, effortless driving. The four-cylinder TDI engine, with a displacement of 1968 cc, is a new interpretation of the strengths of the TDI concept. The piezo injectors of its common-rail fuel injection system operate at a maximum pressure of 1800 bar. Other innovative design features relate to the turbocharger, the toothed belt camshaft drive and the geometry of the pistons. This two-litre engine develops 105 kW (143 bhp) and has the powerful peak torque of 320 Nm between 1750 and 2500 rpm – figures that explain why the new Audi A4 can accelerate from 0 to 100 km/h in 9.4 seconds and reach a top speed of 215 km/h. When combined with the six-speed manual gearbox, the 2.0 TDI is content with an average fuel consumption of 5.5 l/100 km, in which case the 65-litre fuel tank provides an action radius of more than 1,100 kilometres. The four-cylinder TDI can also be ordered with the multitronic continuously variable transmission. In both cases the front wheels are driven. The 2.0 TDI also outperforms the Euro 5 exhaust emission limits. Thanks to improved thermodynamics, it can operate at a higher rate of exhaust gas recirculation, so that untreated emissions of oxides of nitrogen are lower. The cooler combustion process, with less oxygen present, would normally have an adverse effect on efficiency, but by careful attention to detail the development engineers have managed to transform this into an improvement in fuel consumption. Sporty road dynamics and large-car comfort – these were also the overall objectives for the new A4 pursued by Audi's transmission developers. The manual gearbox is a new design; the tiptronic six-speed automatic and multitronic continuously variable transmissions have been intensively revised and improved. All these transmissions are notable for their ease of operation and high efficiency, with short, precise lever or selector travel. The transmission layout has been changed for the new A4: the differential is located immediately behind the engine and is therefore now ahead of the clutch or torque converter. Audi uses two types of six-speed manual gearbox on the new model, depending on the required load capacity. Numerous measures have been taken to reduce internal friction. All manual-gearbox versions of the new A4 have a gear indicator integrated into the Driver Information System display. It shows which gear is currently selected and also informs the driver if a different gear would help to reduce fuel consumption. The new A4 3.2 FSI will be available later with 6-speed tiptronic automatic transmission as an alternative to the manual gearbox. The tiptronic transmission has been extensively revised. It responds more rapidly than on the previous model, with shorter shift times, but its high standard of refinement has nonetheless been retained. For the 2.7 TDI, Audi can supply the multitronic continuously variable transmission; this will also be available in the 1.8 TFSI and 2.0 TDI from 2008 onwards. Its power losses, already very slight, have been reduced still further by a number of improvements. The new variator provides wider-spaced ratios. Thanks to a particularly low drive-off ratio, the A4 with multitronic sprints away vigorously from a standstill. When accelerating in the dynamic Sport programme, eight successive ratios are selected by way of fixed, programmed characteristics, for sporty performance. In the manual selection mode, the driver can select these eight ratios as he or she prefers. Audi has a sporty trendsetter in its portfolio: quattro permanent all-wheel drive. The additional traction, dynamism, driving safety and directional stability it provides are clues to Audi's proverbial technological lead, as summed up in its slogan 'Vorsprung durch Technik'. For the new A4, this driveline has a 40:60 torque split and therefore distributes power to the wheels in a sportier, more fascinating way than ever before. The 3.2 FSI and 3.0 TDI have the quattro driveline as standard equipment. The key element in the quattro driveline for the new Audi A4 is a self-locking centre differential. It has an entirely mechanical action and reacts instantly to changes in the driving situation, thus contributing to the car's sporty, agile road dynamics. In normal driving conditions, it directs 40 percent of engine torque to the front wheels and 60 percent to the rear, but whenever the need arises, the selflocking centre differential takes effect and transmits more torque to the axle with better traction. In this way the new Audi A4 often masters situations close to the traction limit without the ESP/EDL having to intervene, and even if these systems are in action, brake applications are much less frequent. The new A4's dynamic suspension combines sporty precision with high stability and supremely confident road behaviour. It is a totally new design, with many components made from aluminium in order to reduce unsprung weight. Two technological breakthroughs make the driving experience even more fascinating: adaptive shock absorber control and Audi dynamic steering. The Audi dynamic steering system alters its effective ratio according to road speed, and helps to keep the new A4 stable when the handling limits are approached by making slight but extremely rapid steering corrections. The adaptive shock absorber control maintains optimal tyre contact with the road, for safety allied to dynamism in just about every situation, and so that even the enthusiastic driver can be sure that maximum safety is always available. Interchanging the differential and the clutch has enabled the front axle to be moved forward by 154 millimetres. This change, aided by moving the car's battery to the boot, helps to achieve ideal weight distribution. With its wide track –1564 mm at the front, 1551 mm at the rear – the A4 suggests its dynamic power even at a standstill. To drive it is to experience the sportiest car in the midsize category: agile, effortless to handle and safe at all times. With its almost neutral steering response, the new A4 can be cornered at high speeds. The front axle pivot bearings and the five links that locate each front wheel are made of aluminium. At the front of the A4, the engine and suspension support beam is also made of aluminium, and bolted rigidly to the body. The steering gear is located low down and well forward, with the track rod transmitting steering movements directly to the wheels. Rack and pinion steering provides well-defined, sensitive feedback from the road but transmits in effect no undesirable jolts or shake. The steering ratio of 16.1:1 is sporty and direct, but never nervous in its response. The controlled-output pump only delivers the amount of power steering oil actually needed; this lowers fuel consumption by about 0.1 l/100 km. Cars with V6 engines are equipped as standard with power steering that varies the degree of assistance according to road speed. The development engineers based the design of the rear suspension on the controlled toe-angle principle with trapezoidal links used for the larger A6 and A8 model lines; this is a space-saving layout that combines sporty handling with a high level of ride comfort. Applying the lightweight construction principle, the steel axle beam is attached to the body by four rubber bushings; these are very rigid laterally to ensure dynamic handling, but softer longitudinally for greater vertical and lengthwise compliance. The trapezoidal links, wheel carriers, upper wishbones and track rods are all made of aluminium. The well-proven solution comprising separate spring and shock absorber mountings, and in particular the new spring connection points at the wheel carriers, ensure good initial suspension response. Versions of the new A4 with engine outputs up to 118 kW (160 bhp) run on pressed-steel wheels with full-size wheel covers and 205/60 R16 tyres. Cars with more powerful engines have elegant alloy wheels and 225/55 R16 tyres. Optional extras are also available from quattro GmbH: 18-inch wheels with 245/40 tyres and also 19-inch wheels. 8 J x 17 wheels can be obtained with run-flat tyres. Standard equipment on cars with a V6 engine is a tyre pressure monitoring display that operates extremely accurately and reliably. Behind the car's big wheels are brakes with 314 mm diameter front and 300 mm rear discs; the front discs are internally ventilated. The high-performance brake pads, a new development, now cover 20 percent more rubbed area. The front brakes on V6-engined cars are even larger, with 320 mm discs and composite spheroidal-graphite and aluminium callipers. In every version of the A4, the brake pedal has a firm, precise action, and thanks to accurate feedback the driver can control the brake application effectively without applying excessive pressure. The latest generation of ESP stabilisation system adds to the operating refinement of the brake system. New hydraulic valves build up pressure with exceptional accuracy, and the regulating action takes place without judder. At speeds below 70 km/h, the driver can disconnect certain anti-slip functions by pressing a button briefly. The wheels can then spin, but this can be beneficial in certain circumstances, for instance when driving on snow. ESP in the new A4 has a number of additional functions – it can for instance stabilise a trailer if it begins to snake, dry the brake discs in wet weather and activate the hazard warning flashers if a panic brake application is made. Those who drive the A4 hard and enthusiastically can choose between two sports suspension settings, or alternatively rely on an innovative technology – the innovative system known as Audi drive select. This is available in various stages, which influence an increasing number of technical components and functions on the car: accelerator pedal response, tiptronic shift points, power steering assistance, the steering ratio and the action of the electronically adjustable shock absorbers – another new feature. The driver can select the comfort, auto or dynamic modes at switches on the centre console. If the A4 is equipped with the MMI control system, a fourth mode, "Individual", is available; this enables an individual profile of 24 settings to be configured. Audi drive select transforms a single A4 into up to four different cars – a range of driving pleasure, dynamism and ride comfort that is unmatched in the midsize car category. The new A4 features yet another pioneering technological development: Audi dynamic steering. Its key element is a superimposed gear system that alters the overall ratio according to road speed and the chosen Audi drive select setting. This concentric-shaft steering gear is extremely compact and light in weight; it has a precise action free from any slack. It was first developed for use in robots and for space travel applications; the expedition vehicles on which it was installed have already traversed the surface of the moon and Mars. Audi dynamic steering makes the steering ratio more direct at low speeds, with ahigher level of power assistance. This renders the steering extremely light when manoeuvring, and only two turns of the wheel are needed from lock to lock. As the car's speed increases, however, the steering ratio becomes gradually less direct and in parallel with this the amount of power assistance is reduced. At high motorway speeds the A4 can therefore be driven smoothly and has excellent straight-line stability. Audi's high-tech steering can do even more. It is closely networked with the ESP and therefore receives precise information about the car's attitude as the handling limit is approached. If the A4 threatens to oversteer, for instance after an abrupt avoidance manoeuvre, the steering performs slight corrective impulses in the direction needed to reduce this tendency. Such corrective action takes place faster than even an experienced rally driver could react. This rapid response means that brake applications are often not needed, so that the car continues its journey more smoothly and dynamically. The system also takes action if the car understeers: it selects a more indirect steering ratio for a short time, the aim being to prevent the driver from turning the steering beyond the point at which the tyres still have plenty of road grip. With these capabilities, Audi dynamic steering represents leading-edge technology in this car market segment. The optional-extra damping control permits individual suspension settings to be chosen. These are based on the lowered sports suspension. Continuously adjustable hydraulic shock absorbers permit the damping characteristic to be varied individually at each wheel. This means optimal contact between the tyre and the road in almost every situation, for greater safety and more dynamic road behaviour. The new Audi A4 can be ordered ex factory with one of four equipment and trim specifications, all of them with a very full list of items. The new saloon model, however, can be further enhanced by choosing from a selection of luxury optional extras. Its innovative assistance systems and the broad range of electronic components are taken directly from the large luxury car programme. The four equipment and trim lines have been named Attraction, Ambition, Ambiente and S line, and each of them can be ordered with any of the available engines. Even the Attraction line gives the new A4 a high level of comfort and convenience. 16-inch wheels emphasise its sporty character, and the daytime driving lights give it a striking presence on the road. Automatic boot lid opening, the electro-mechanical parking brake, the 6.5-inch black-and-white display screen and the automatic air conditioning all add to the high standard of comfort and convenience, and the 'chorus' radio with MMI control logic has a CD player and eight loudspeakers. Ambition, the second equipment and trim line, is sporting in character. Its most obvious feature are 17-inch diameter cast aluminium wheels of six-spoke design. Sports suspension, which the customer need not specify if not required, makes the handling even more dynamic, and the three-spoke leather-covered sports steering wheel is a striking feature of the interior. The third equipment and trim line is Ambiente, which focuses on comfort. The A4 then runs on specially designed 16-inch cast alloy wheels of seven-arm pattern. The front seats can be heated. The Audi parking system makes parking in reverse easier and cruise control maintains a constant road speed when required. Other features for extra comfort and convenience are the multifunctional leather-covered steering wheel and a front armrest with two power sockets; the lighting package adds further highlights. Customers with a dynamic approach to driving will tend to favour the sporty S line, which offers an exterior design package and a sports package. Among its most attractive items are visual changes inside the car, extra-firm suspension settings, 18- or 19-inch alloy wheels and two exclusive colours: Misano red and Monza silver. Audi has a complete system of modular elements to offer in the communication and infotainment area. The first stage above the standard 'chorus' radio offers an upgrade to the 'concert' or 'symphony' systems. Both are from the new generation of audio equipment and operate in conjunction with a 6.5-inch display screen. The controls for both systems – a turn-and-push knob and large switches that can be operated intuitively – use the much-praised MMI logic principle. Both these radios include a double tuner, and the DAB digital broadcasting standard is available if required. A six-CD changer is integrated into the 'symphony' radio. An optional extra for both systems is a lifestyle feature that looks well ahead into the future: the Audi Music Interface (AMI). It has iPod capability, with the menu structures visible on the car's display screen. Music from other players can also be listened to by way of the AMI interface. The next two system stages feature the MMI Basic plus or standard navigation system with DVD including MMI. In these cases, all the system's controls are moved to the MMI control terminal. MMI Basic plus has a black-and-white screen with arrow display and an integral audio CD changer. The full version of the navigation system with DVD including MMI incorporates a double tuner and a 7-inch colour screen, with navigation information taken from a DVD drive. The high-end system can be extended to include voice control, the Audi Music Interface and a digital TV tuner. For perfection in sound reproduction, Audi can offer two high-class audio systems. The Audi Sound System has a 180-Watt rating and ten loudspeakers. The ultimate choice, however, is the Sound System from Bang & Olufsen. Brilliant high notes, authentic detail resolution, precise sound stage reproduction and a broad, subtly differentiated frequency spectrum – this product from the Danish audio champions satisfies every demand for top precision and quality. A 505-Watt amplifier transmits its signals according to a surround algorithm developed specially by the manufacturer, permitting the full sound experience to be enjoyed at every seat in the car. This system has ten active channels with 14 loudspeakers. The two MMI systems both allow a mobile phone to be integrated in a very elegant manner with Bluetooth. If the driver's mobile phone supports the SIM Access Profile, it only needs to be logged into the A4's system once. The car's system then performs all the available functions automatically as soon as the driver inserts the ignition key. The mobile phone can remain in the driver's pocket; the A4 phone can access all the data from the SIM card and the internal memory. The mobile phone then shuts down, so that its battery is not drained. The Bluetooth car phone uses the car's own aerial and is operated by voice input, via the MMI or at the multifunctional steering wheel. A digital speech processor ensures the best possible hands-free quality. Output is via the Sound System, using the radio volume control. Audi has developed a wide range of assistance systems that bring large-car luxury to the midsize category. The Audi parking system advanced uses a rearview camera to simplify parking. What the camera sees is shown on the monitor screen of the MMI control system, together with various guide lines and panels to help in positioning the car. Audi lane assist is a lane monitoring system that operates above about 65 km/h and warns the driver if he or she departs from the chosen lane. A miniature camera on the windscreen views the road ahead and a computer identifies the lane lines. If the car moves toward a lane line without the driver having made a turn signal, Audi lane assist warns him or her by means of vibration at the steering wheel. Vibration intensity and the point at which the warning starts can be selected in three stages. Audi side assist is specifically intended for situations in which the driver wishes to change lanes. Two radar sensors in the rear bumper scan the area behind and alongside the A4; their signals are evaluated by a computer. If another vehicle is moving at the same speed in a critical area or approaching fast from behind, an LED display comes on in the outside mirror housing as a warning which the driver identifies subconsciously. If the driver operates the flashing turn indicator, the system interprets this as a sign that he or she still intends to change lanes. The light-emitting diodes then become brighter and flash for about one second at a higher frequency. This warning is extremely difficult to ignore. Audi side assist is in action above a road speed of 60 km/h. Another assistance system that has initially been available only on luxury cars is radar-assisted adaptive cruise control (ACC). It normally maintains any preselected speed between 30 and 230 km/h, but can vary it by taking the distance from the vehicle ahead into account. The radar signals scan an area 180 metres long and cover an angle of eight degrees. The computer analyses them to determine whether and to what extent the distance from the vehicle ahead is changing. The A4 driver selects the desired speed and chooses one of the programmes that determine the time gap from the vehicle ahead and the regulating dynamic. The system keeps the vehicle at the necessary speed by accelerating or braking as the need arises, but with the occupants' comfort also taken into consideration. The rate of retardation when braking is not allowed to exceed 3 m/s2 at 50 km/h or higher. In certain situations, for instance if the driver ahead brakes sharply and suddenly, this automatic speed reduction may be insufficient. In such cases Audi braking guard, one of the functions included in the ACC, takes over. It calculates whether sufficient time remains available to steer round the obstacle ahead, and allows the driver a few moments to take the necessary action. If the driver does not react, he or she is called upon by an audible warning signal and red flashing lights to apply the brakes. If the driver still does not react correctly, the Audi braking guard brakes the car sharply for a brief moment. This lasts no more than 0.3 of a second and causes the speed of the A4 to drop by a maximum of 5 km/h. This abrupt braking action 'rouses' the driver. If he or she now makes an emergency brake application, the brake assistant will support it by ensuring that full braking pressure is immediately available. Previous post Would you drive this car on the US roads and highways? Next post Batman’s new car: Bugatti Pur Sang ?